We received a warm welcome when we arrived at Little Edgewater Ranch in Indus, Alberta. Verne Kemble and his partner Connie Challice greeted us along with their visiting friend LeVern Livingstone. After sharing a wonderful barbeque and conversation together, we wanted them to share their story, and out came the camera. Verne has lived on Little Edgewater Ranch since 1975. Horses are Verne’s passion. He is also a wheelwright, wagon builder and horse trainer. His horses areÂ Belgian/Quarter Horse crosses. Verne uses his horses for weddings, parades, haying, plowing, discing, cultivating, harrowing, seeding, grading, cutting and threshing. In this production Verne shares his story and his love of working with horses. In this video Verne and his partner Connie explain how they restored a â€˜piano wagon’ into a beautiful limousine and they gave us an enjoyable ride. 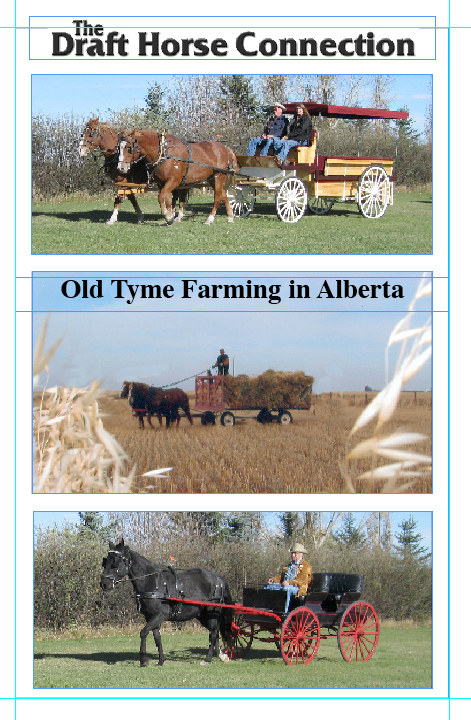 Verne and Connie demonstrate their horse drawn grader hitched to Connie’s Clydesdale team. 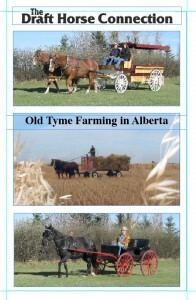 Verne enjoys taking his horses to public events and he is seen driving his four up at Pioneer Acres Heritage Museum on a stagecoach. Verne and Connie host an annual old fashion harvest bee and they share this with friends and neighbours on this DVD. Connie grew up around horses. Connie has had a lot of fun with her team of Â Â Â Clydesdales that she bought when they were two years old and trained herself. Connie has used her team at Spruce Meadows giving wagon rides and now she uses them for everything from farming, hay rides, weddings to running away with friends to the mountains camping. Connie is also a talented Natural Hoof Care Practitioner. These two talented and skillful teamsters have a wealth of knowledge to share with viewers. In this production we also meet LeVern who boards his Canadian Standardbred Cross at Verne’s ranch. LeVern grew up through the depression years and he reminisces about his love of horses and the valuable life lessons he learned while working on his father’s ranch in Saskatchewan. Â LeVern uses his horse doing farm work, as well he rides and drives his horse on trail rides and parades.